It is often said that Canada was built around railways and railways built the communities. Not so for the Burrard Inlet (BI) Line and Vancouver. The BI Line was built in the middle of a thriving residential community, Strathcona, that predated its existence by over a decade. 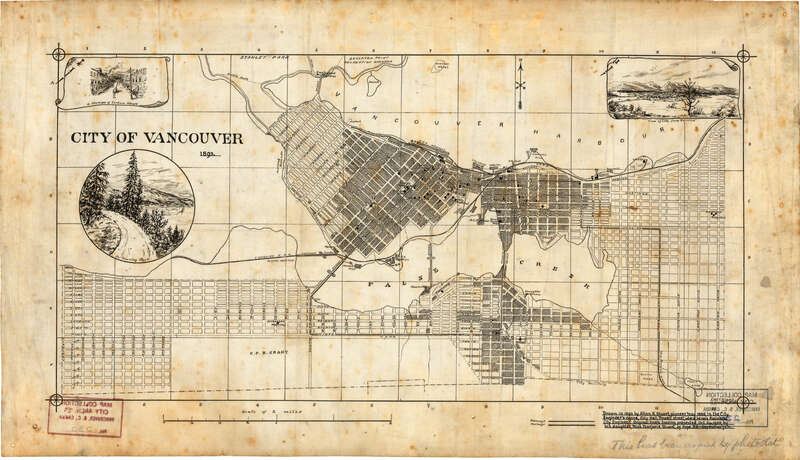 In 1867, colonial settlement of Vancouver began in the neighbourhood now known as Gastown. Gastown is less than two kilometres west of what is now the BI Line. The Great Vancouver Fire of 1886 destroyed nearly all of the settlement but it was quickly rebuilt. Also in 1886, the first CPR transcontinental train arrived in Vancouver, and Vancouver was incorporated as a city. As settlement expanded outwards from Gastown, the neighbourhood now known as Strathcona was settled from west to east. Vancouver’s oldest school, Lord Strathcona Elementary, was founded 700m west of the BI Line in 1891. As shown in the map below, by 1893 settlement had reached an area that is now bisected by the BI Line. This map shows original street names: Glen Drive was previously called Boundary, East Pender Street was formerly Princess, Keefer Street was formerly Harris, and Union Street was formerly Barnard. This map also shows the original alignment of Raymur Avenue, which was changed in the 1960s. A panoramic map of Vancouver from 1898 shows considerable settlement in the area immediately east of the future BI Line, between Hawks Avenue and Campbell Avenue. Several homes west of the BI Line were built between 1899 and 1904. Around 1901, construction of Admiral Seymour Elementary School began 65 m east of the future BI Line. It opened in 1907 and remains in use to this day, with an enrollment catchment area that is still bisected by the BI Line. The buildings at Admiral Seymour Elementary initially also served as the classrooms of Britannia Secondary School, which moved to a new building further east in 1910. The area currently affected by train noise and vibration includes a large number of official city heritage buildings, represented as icons in the map below from the Vancouver Heritage Foundation. That so many century-old homes are still in use is a testament to their craftsmanship, their intended use as permanent year-round residences, and to the neighbourhood’s historical and cultural value to the wider community. Between 1888 and 1908, the estimated population of Vancouver exploded from 8,007 to 79,513. By 1909, the city’s eastward expansion along East Pender Street had reached Semlin Drive, 1.3 km east of the BI Line. The start of construction of the BI Line was announced in the Vancouver Daily World newspaper on April 23, 1909 with the headline “Work Begun on Spur to Inlet”. Residents of East Pender, Keefer, Harris (now East Georgia), and Union streets saw their blocks cut in two by the new railway spur, as shown in the 1912 map below. The above map is an excerpt from Goad’s Fire Insurance Map of 1912, which is available as a layer on the VanMap website (click on "Aerial imagery" to see the option to turn on this layer). Wooden buildings are shown in yellow. Brick buildings are shown in pink. The southern end of the BI Line was below the high tide line at the time of construction, part of a vast tidal flat in the eastern end of False Creek that was a rich source of food for First Nations. Around 1916, the area that is now Glen Yard was created by filling in these tidal flats. According to the City of Vancouver, the BI line “divided Strathcona and isolated this part of the neighbourhood... and contributed in part to the conversion of many properties to industrial use.” In the 1960s, a large area of Strathcona’s original buildings were cleared for the Stamps Place housing complex. Advocates for preservation of the neighbourhood’s heritage architecture eventually prevailed, achieving the introduction of RT-3 zoning in 1992 and other initiatives to protect and strengthen the residential character of the area. Strathcona today is a beloved cultural hub and family neighbourhood, and a top destination for architectural walking tours of the city.